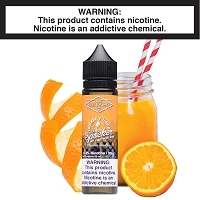 The Show Stopper by Shocker E-Liquid Hits your sweet spot. Cinnamon danish with butterscotch, vanilla, and caramel folded in to make this deliciously creamy flavor. Hits your sweet spot. Cinnamon danish with butterscotch, vanilla, and caramel folded in to make this deliciously creamy flavor. I bought the set of all the Shocker flavors and have enjoyed every single one, but my favorite by far is the Show Stopper. I can taste each flavor (cinnamon, butterscotch, vanilla & caramel) with each puff, and absolutely love it! 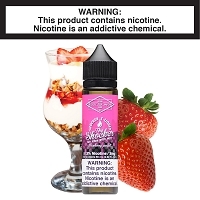 I've used a lot of different flavors from many, many vendors but the Shocker flavors, and Show Stopper in particular, are the best I've found. My first experience with vaping was when Rocky Top was at the Flea Market and I'm still a Rocky Top fan! I love this stuff. I got it wanting to break out of the vaping slump I had been in and it didn't disappoint. I get heavy cinnamon on the inhale but a sweet cinnamon. Not a hot one. And the vanilla and caramel on the exhale. I was glad the butterscotch wasn't super loud as I don't like butterscotch. And in my true form, I had to cream it up with a little Audio Fog Flux mixed in. Those two together taste exactly like a cinnamon twist from Taco Bell which is one of my favorite snacks. Now I can just vape it and save myself the calories. Love this! It's YUMMY! The title is long time Paratrooper lingo for this can't get any worse or better. In this case it can't get any better. This juice is so flavorful and blended together so perfectly, the only other blending perfection I can compare it too is Johnny Walker Blue. 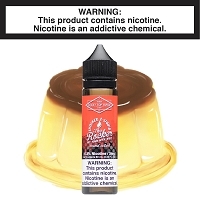 The cinnamon has no throat hit and it doesn't overpower any of the other flavors, you get the whole package. I've taken out a second mortgage, so get yourself some, before I buy it all.